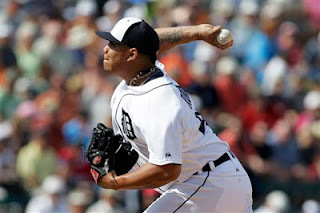 While he struggled during spring training and during a brief stint with the Tigers earlier this season, Bruce Rondon has put up impressive numbers for Triple-A Toledo. His ERA is 0.77. Opposing hitters are batting just .118 against him. He has struck out 29 in 23 innings. He has 10 saves. But Rondon still has command problems. June 5, he walked four in two thirds of an inning at Columbus. The issue is accelerated at the major league level because hitters don't swing at nearly as many bad pitches. Also, Toledo isn't exactly the best place to groom a closer right now. The Mud Hens are awful, winning the fewest games in the International League (26) so far this season. If the Tigers were to call up Rondon, it would be much smarter to break him in a lesser role than closer. Right now, it's highly doubtful his command of the baseball would hold up in such pressure-packed situations. I do agree it is Rondon's time and break in as 6/7 inning guy first. We need an upgrade now from Valverde. Long term solution would be great - but it looks like nothing is in the works that we can publically see. Rondon looks like he has earned a second shot - And I'm certain that he would do better than 5 homers in 5 and two-third innings closed. To not make an immediate change is just to foster fan outrage and cripples the rest of the teams productivity. The chances for Valverde have to end soon - this was his second chance. Rondon might be ready for the major leagues in 2 or 3 years from now. In the meantime the Tigers will have to augment their pen, from the trade mart at the deadline, to have any chance of competing in post season play.